Not to be confused with Ultimate NES Remix. NES Remix Pack, known in Japan as Famicom Remix 1 + 2 (Japanese: ファミコン リミックス 1 + 2 Famikon Rimikkusu 1 + 2) is a compilation title on Wii U consisting of both NES Remix and NES Remix 2, released at retail and on the Nintendo eShop for a combined price. As such, the game features every remix challenge from both games, as well as the same Miiverse features. The Championship Mode from the second game is also available to play at any time from the start. For a complete list of media for this subject, see NES Remix#Media. 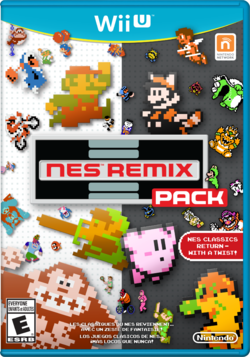 For a complete list of media for this subject, see NES Remix 2#Media. ↑ Nunneley, Stephany (August 29, 2014). Nintendo release line-up: Bayonetta 2 dated, first 12 amiibo figures announced. VG247. Retrieved August 29, 2014. This page was last edited on January 20, 2019, at 14:13.